It was in March of 1996 when I received in the mail one of the greatest gifts of my childhood: a subscription to Nintendo Power magazine. On the cover of that month's issue was a picture of Mario, Bowser, and some odd cloud person who were standing in front of an eerie fortress, with Mario swinging down a huge hammer, and etched into the mallet was the boast of an eight page “power preview” of Super Mario RPG: Legend of the Seven Stars. To this day, I'm not sure what a “power preview” is compared to a regular preview, but regardless, I read this issue from front to back over and over again, until the publication was falling apart at the seams. While I had occasionally seen the magazine before, it was rare when the party store near my home would stock this magazine, so I only occasionally had access to it, save for another student bringing a copy to school, and letting me sneak a peek at it. While I was enthralled with the idea of a role playing game with Mario in it, there was another article in this issue which captured my imagination, a strange game called Tales of Phantasia. While some of you might be familiar with the Tales series from the more popular release Tales of Symphonia on the Nintendo GameCube, what some might be unaware of is that the Game Boy Advance game Tales of Phantasia was released on the PlayStation in Japan only. Before that though, Tales of Phantasia was found on the Super Nintendo, and the March issue of Nintendo Power in 1996 had a few pages devoted to it, previewing the game. The author of the original article deserves heaps of praise for not only knowing that this game existed in Japan, but using the article as a thinly veiled request to bring it over to America. The author even gave credit to the game's artist Kosuke Fujishima, who had even gained a bit of popularity in America for the manga Ah, My Goddess! It's a shame that the author never saw his wish fulfilled though, as the game was released in Japan on December 15th of 1995, and within a year the Nintendo 64 was coming out in America; no doubt that Namco didn't want to take the gamble on localizing a huge RPG right before the end of the Super Nintendo, as the Nintendo 64 was slated to release on September 29th of 1996. 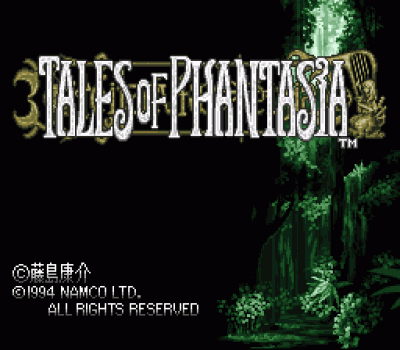 It's really a shame that Tales of Phantasia was never officially brought to the Super Nintendo in America, as it might just be one of the most technically impressive games to ever grace the Super Famicom. It's art and graphics are amazing, the music is great, and it might just be the only Super game to have voice acting and an opening song. The voice actors that were used were incredibly impressive, as the main character Cress is voiced by Takeshi Kusao, who's to this day voicing Trunks from the Dragon Ball series. Another character Mint is voiced by Satomi Korogi who voices many of the Pokemon from the series and movies like Togepi and Mew, and the rest of the cast has many other memorable roles. The opening The Dream Will Never Die is sung by Yukari Yoshida, which sounds like a Japanese pop song straight from a 90's anime. While the song and voice acting has been compressed to fit on a 48-megabit cartridge, it's insanely impressive that they were able to do this with an SNES game. To give you an idea how large a 48-megabit cartridge was, Chrono Trigger and Earthbound used 32-megabit carts, which was still large compared to most other Super Nintendo games. The opening song has a certain beauty and charm to it, that no other SNES game was able to accomplish. While there would come different versions of the game, with clearer voices and songs, the Super Nintendo version that never left Japan will always hold a special place in my heart. Despite the fact that the author of that Nintendo Power preview and I never got our wish, the Dejap team of translators were able to do the next best thing years ago, and released a translation patch, and while the team made the game a bit crude, it was still wonderful to be able to experience this RPG in all it's surprisingly 16-bit glory. With it's unique battle system of fighting on a 2D plane in real time, and a plot that involves time travel and evil mages, it's a wonderful game, but I might just remember it most for it's unique opening and that special Nintendo Power preview I gazed at when I was a child. Krusty's Super Fun House Is Actually Fun?